Are you an artist, master craftsperson, or handmade artisan interested in applying to the Letchworth Arts & Crafts Show in 2019? Please visit our Exhibiting Artist web page at this link. Information on the 2019 Application, Application Process, and Contact Information are all contained on that page. Thank you and good luck! For 44 years, the Arts Council for Wyoming County has presented the Letchworth Arts and Crafts Show (also known as LACS) in beautiful Letchworth State Park in Western New York (USA Today's 2015 Reader Poll's #1 United States State Park). The Arts Council for Wyoming County produces the event that has grown from a small group of local artists displaying their work outdoors to a show that hosts over 325 artists, master craftpersons, and handmade artisans from throughout the country. This groundbreaking show has been ranked is the top 50 Art Festivals in the United States by Sunshine Artists Magazine. Make plans now to spend Columbus Day weekend at this "state of the arts" festival. The show hosts some of the country's finest visual artists, artisans, performing artists, craftpersons, as well as many traditional & unique consumable foods. Choose from some of the best pottery, paintings, quilts, fiber arts, handcrafted jewelry, photography, furniture, decorative painting, dried floral arrangements, packaged specialty foods, and so much more. Over 325 artisans display their wares along with many food vendors, live entertainment, and other fun activities for the entire family. The Show is held at the Highbanks Recreation Area of Letchworth State Park, also known as the “Grand Canyon of the East,” during peak fall foliage season throughout the park. Admission to the festival is free with an $10 per car entry fee to the park. Handicapped parking is available. Please inquire about curbside pickup of heavy purchases at the information booths at the festival. Saturday, October 12: 10-5 p.m.
Sunday, October 13: 10-5 p.m.
Monday, October 14: 10-4 p.m. Please follow this link for driving directions to the Letchworth Arts & Crafts Show. Information will be announced closer to show time. Please check back at that time. To download a copy of the 2018 Letchworth Arts and Crafts show map please follow this link to find the show map. For more information about applying to the show as an exhibitor, visiting the show, or sponsoring the show, please call (585) 237-3517. The Letchworth Arts and Crafts Show includes juried awards for exhibitors in many categories. If you are a current or future exhibitor, look for information on the juried show in your acceptance packet. Awards for the show include a monetary award and a complimentary booth for the next year's show. 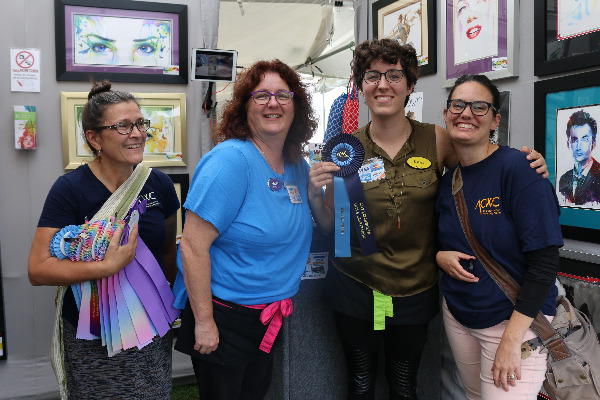 Concord Art Glass (Pittsford, New York) won best in show with their glass art.